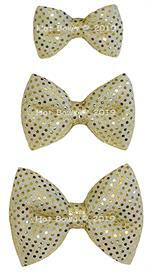 New dimensional BowTies by Hot Bows® for dogs that need FABULOUS accessories. Available in 6 size options for everyone. Also totally cute and perfect for kids to use as headbands. A feminine take on rainbow pride with this multi-color satin ribbon on decorated white elastic with rainbow hearts. BowTies the newest handmade accessory to join the Hot Bows® product line utilizing the same fun and whimsical ribbon Hot Bows® is known for. Glitter rainbow ribbon with a red glitter elastic for the neck. A pink and white finely striped BowTies on a pink elastic decorated with tiaras and magic wands. Neon pink and green plaid on an bright pink elastic with foil matching hearts. Black sheer bow with contrasting white ribbon and a chevron black elastic. A black and white harlequin ribbon on a glittered black elastic. Beautiful purple ribbon with purple flowers on a purple flowered elastic. Emerald BowTies on a green glitter neck band. Sizing would be similar to your pets collar; available in 5 elastic sizes 10”, 12”, 14” 16” 18”. handmade bows are approx. 3.5” to 4” in length. The bright colors of a fiesta on this bright pink ribbon on a pink elastic. Cute red, white and blue stars deocrate a tan grosgrain ribbon on red elastic. A beautiful navy blue edged in gold thread on a 3/8" wide gold elastic. Red, White and Blue grosgrain ribbon on a large red and blue dotted elastic. Copyright © 2019 . All Rights Reserved. Hot Bows.